Thankfully, our community came through! From SevenOaks Shopping Center giving us the loading area of the former Sears to distribute gifts, to all those who donated time, services, finances, or all of the above, we could not have done this without your help. We know that many of you had to make sacrifices to be able to support those in need through the Christmas Bureau, and we are so grateful for your generosity and heart for others. Witnessing our community love and support families who come for help is truly a humbling experience. Together we were able to help a total of 1,672 children, 200 seniors and 539 families. All together we helped 3,515 people experience the joy of Christmas by providing gifts and food. As you have read, putting together a program like the Christmas Bureau doesn’t happen in isolation. We need partners like you on so many levels. This year our fundraising goal for Christmas was $1.2 million dollars. 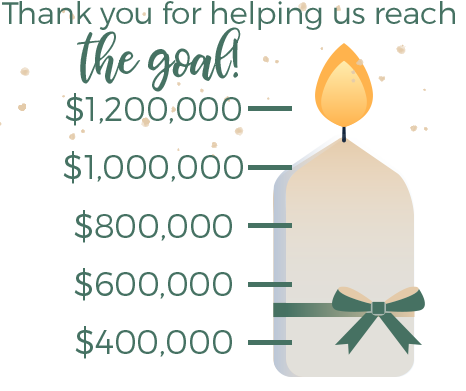 While we didn’t quite make the December 31st deadline, we are happy to let you know that we reached the goal mid January. That means, we are well on our way to be able to continue the many programs that benefit our community throughout the year and especially at Christmas. Prepare to have your heart warmed by some of the stories that we’ve received from sponsors, seniors, and families. We hope they impact you as much as they have impacted us.